I wrote this eulogy for FMA after the reports of its imminent demise start to come out. Thankfully (though still mysteriously) it has since been SAVED! Read on for a cool 750 words about how/why I was going to miss FMA so much. It was with surprise and delight that I first visited Free Music Archive in 2012. My band, Rations, had recently released a 7” EP called “How Much Land Does A Man Need?” and we offered the download on Bandcamp with a Creative Commons Noncommercial Share-alike (CC BY-NC-SA) license. Then, through some magic of the internet the songs wound up on this awesome site called Free Music Archive, packed to the gills with creative people excited about collaborating on music. I thought it was the best thing in the world. As months ticked by, I realized that our download and stream counts at FMA were surpassing the same at Bandcamp. Rations started cooking up plans for the band’s next EP. “Martyrs and Prisoners,” was to come out in the spring of 2013. This time we were going to license it as Attribution ShareAlike (CC BY-SA). Without question, the prior experience with the Creative Commons and FMA was the primary reason to we decided to use a more open, Free Culture license. In fact, this is when I first wrote to FMA. I wanted to make sure the new EP would be uploaded so we could point the download cards there. I got a response from now-famous podcaster, then-FMAer, Andrea Silenzi, setting me up with “Curator” status so I could upload myself. Nice! We printed up download cards, making sure to evangelize Creative Commons and FMA in the process. What followed was a handful of people using our songs in some really awesome videos (and some really crumby ones). And a boatload more people hearing our music. Because the songs are issued with a Free Culture license, video creators are free to use it, even commercially, as long it’s credited. Our songs quickly wound up on a ton of free music directories and download sites, and in turn as the background music in ton of videos on vimeo, youtube, and elsewhere. My favorites are “The Hum”, a student short film from Spain and “Fluggenock”, a short documentary about the political cartoonist that aired on Free Speech TV. Though I must admit, a since-removed low resolution compilation of a woman doing yoga set one of our songs has to rank up there as well. There were over 1 million views on the video and about 60+ comments about how awful the music was. That was pretty awesome too. There was a lot of sports stuff. “Friends With Helmets” - a Dutch BMXer documentary - was probably the most polished, but there was also mountain biking in Japan, Finnish frisbee golf, Outlaw skateboarding in Kansas City, Snowboarding in the Swiss Alps, and a bunch more. If other people can get this kinda mileage out of our stuff, why can’t we? With Rations going on hiatus in 2014, I set to work on a Rations remix projects with my friend Beaker. The collection of five songs that emerged will be released January 11th, 2019 as a CD/LP/DL. In addition to studio, practice, and live recordings, “Dronestruck” uses words and images from the Public Domain to tell its story. All the original and derivative work (along with our STEM files) will be made available on the companion website at 86drec.com/rations/dronestruck. We’re also planning to re-upload our two 7” EPs, this time both licensed for the public domain, on December 14th, 2018. That’s what my todo list said on the day I saw the tweet about FMA closing down. I was going to write about how thankful I was for FMA getting our music to so many interesting and meaningful places. I was going to link to our newer stuff that wouldn’t have been possible without FMA. And probably most importantly, I was really looking forward to the reply that would surely have set off a whole new round of great connection and collaboration. Rations is/was a punk band from Long Island, NY active between 2008-2013. 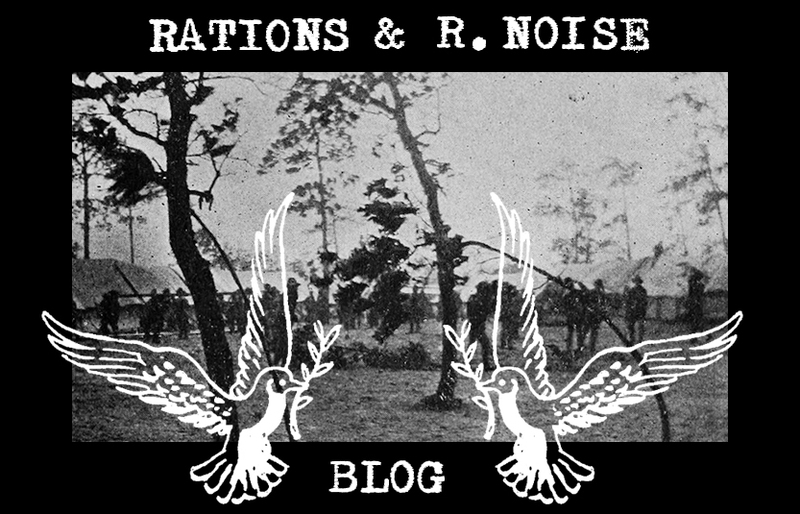 Rations Noise is an electronic offshoot formed in the aftermath. Contact us by email at wells@86drec.com or by mail at P.O. 501 East Setauket, NY 11733-0501 U$A.